Using chalkboard paint for craft projects and home décor pieces is all the rage now. How neat is it that you can make any surface you want into a chalkboard?! There are tons of different things you can do with this versatile and useful paint. You can buy chalkboard paint at home improvement stores, arts and crafts stores and even at Wal-Mart. It comes in small 2 oz bottles, small cans and jars, large cans and there is even a chalkboard spray paint you can purchase. The best thing about chalkboard paint is that you can actually make your own very easy. Keep reading to learn more about chalkboard paint and see some fabulous home décor and craft projects. Create.Love.Grow made these framed chalkboards.. I think they would look nice grouped on a wall together or like at the link above, you could also write something clever inside the frame and have someone pose in a picture holding the sign. It would make a very cute photo! 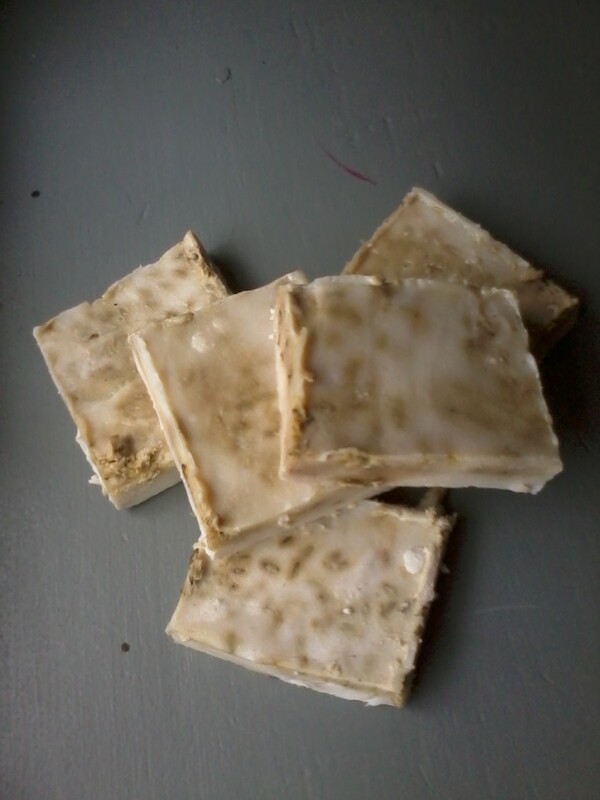 Visit the link to see how they were made. Simply Salvage has the complete tutorial on how to make a DIY magnetic chalkboard like the pink one in the photo. I love this color of pink.. I think it's fabulous against the black chalk board. Be sure to visit the link to see all of the other pretty colored framed chalkboards that were made. 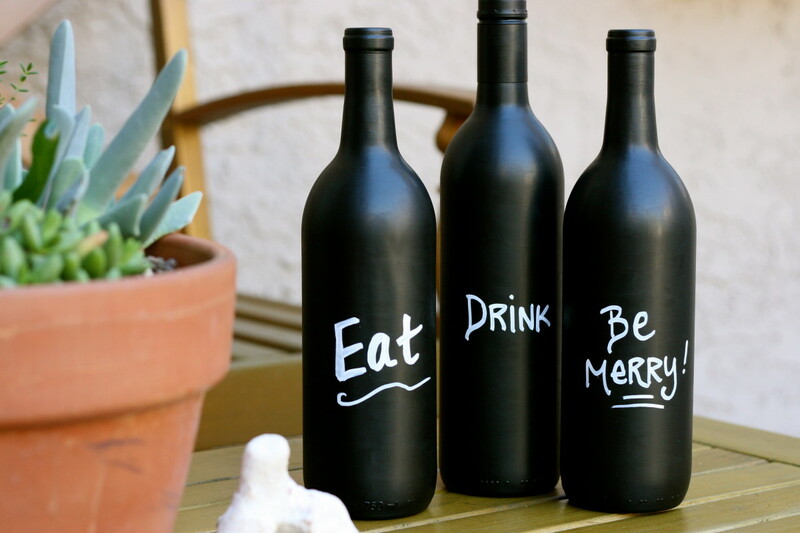 Nook and Sea has the complete tutorial for these cute wine bottles painted with chalkboard paint. Who would have thought that wine bottles would make a good chalkboard? I think this is super cute.. and you can change what they say from day to day. 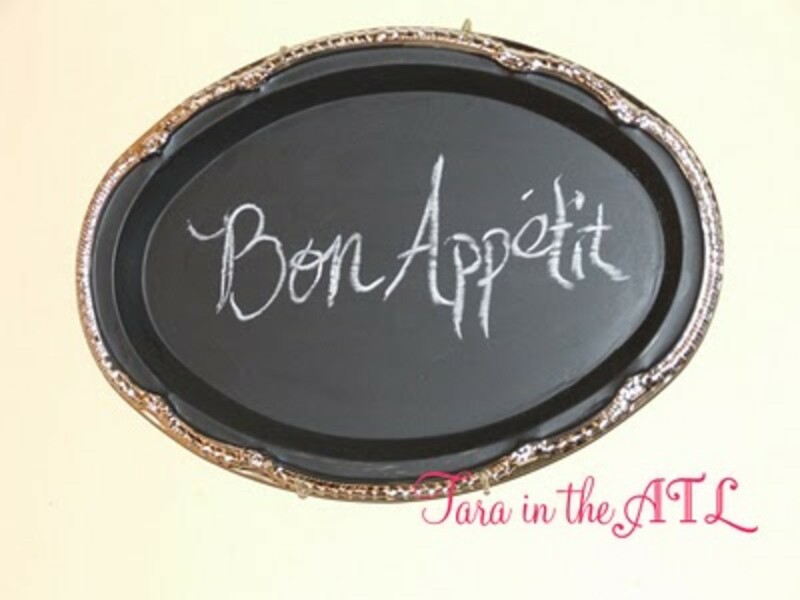 Tara in the ATL shares how she made this neat chalkboard from a large platter... and she also shares some money saving tips, too. 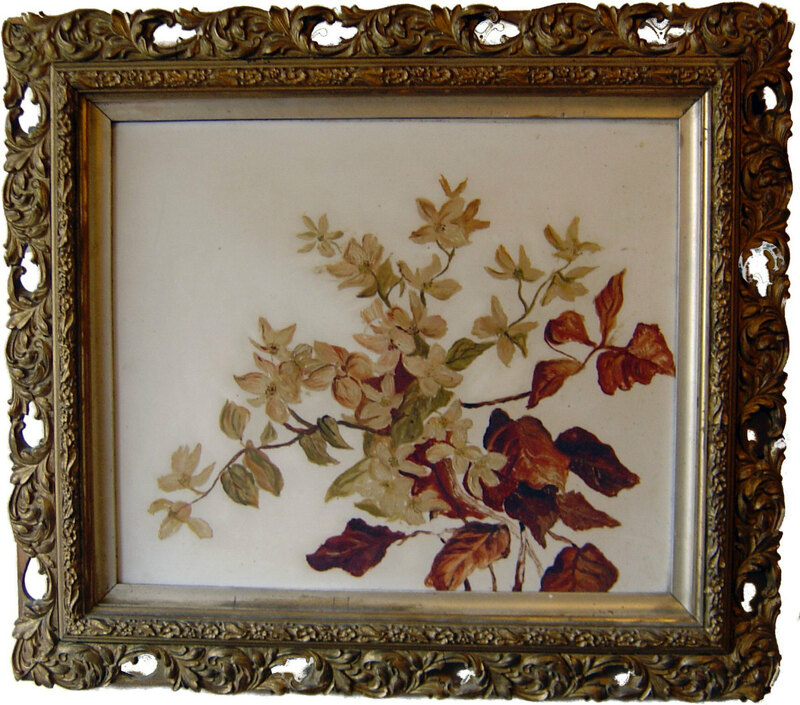 This one would look cute hanging in the kitchen, I think..... or what about a group of platters? I'm so excited I can't wait to get my hands on some chalkboard paint! Did you know that chalkboard paint comes in colors, too? 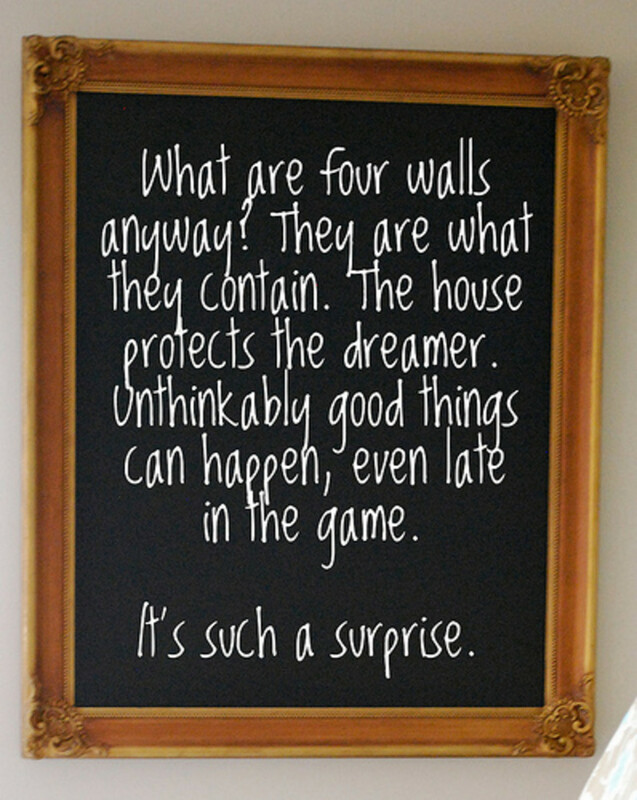 What is even better than that, did you know that you can MAKE YOUR OWN chalkboard paint out of any color you want? Yes, it's true.... and it's super easy. 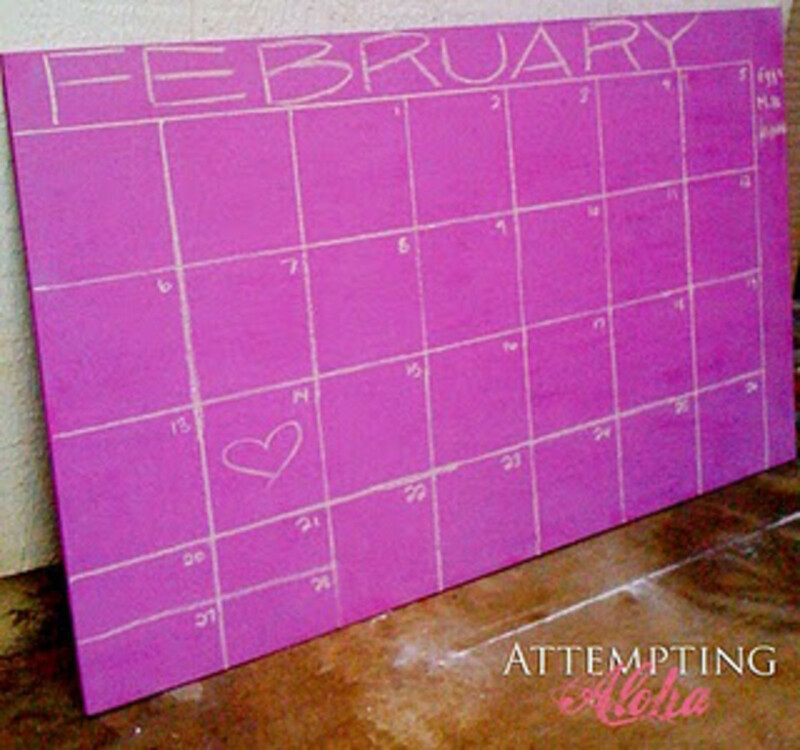 Visit Attempting Aloha to get the how-to and see how the cute pink chalkboard was made. Here is a nice larger framed chalkboard I found at Pink and Polka Dot. It started out just as an old, yet larger framed painting but was made into this fabulous chalkboard. Be sure to visit the link for the before photo and how she did it. I like these wooden painted tags I found at Joys of Home . They were apparently purchased at a Dollar Store in the craft section and then painted with chalkboard paint. These could come in useful for gift packaging, labeling jars, tree ornaments,etc. The Idea Room has the tutorial for this cute chalkboard mug.. This would make a super cute gift, especially for Valentine's Day. 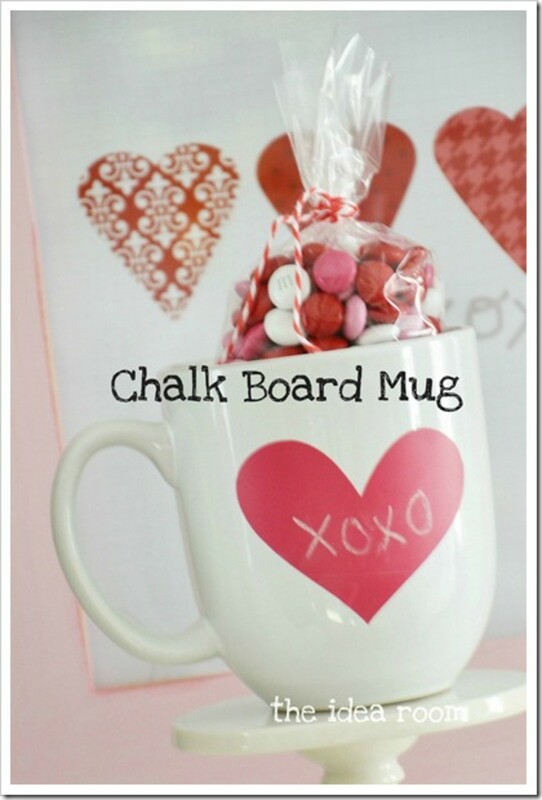 Don't forget, you can make your own chalkboard paint in any color you want and put any shape on the mug.. The possibilities are endless! 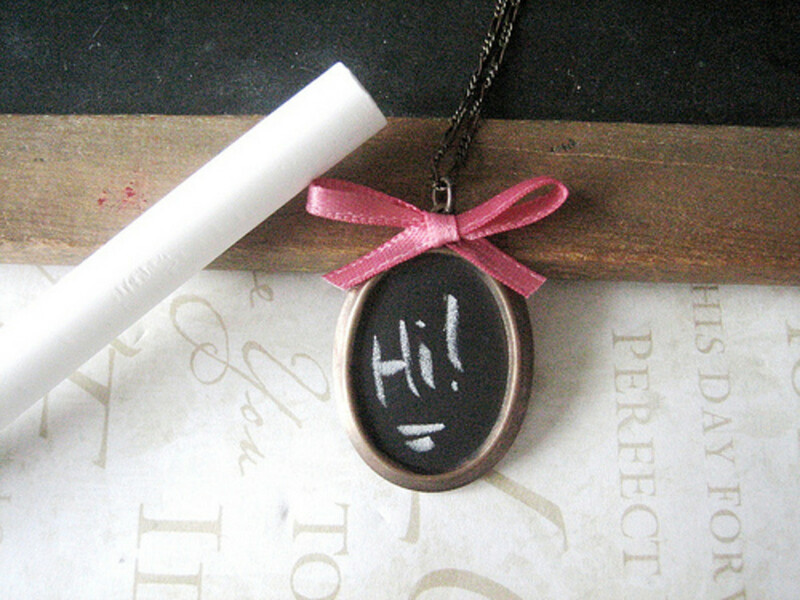 Henry Happened has the complete tutorial on how to make this cute chalkboard necklace.. 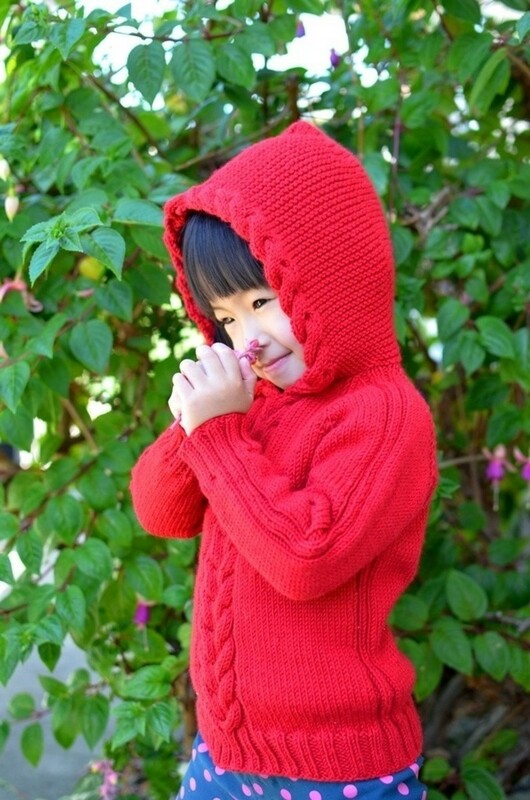 I think any little girl would just love to get this as a gift. They can write something different on it every day or maybe they would rather doodle some art... This is such a neat idea. 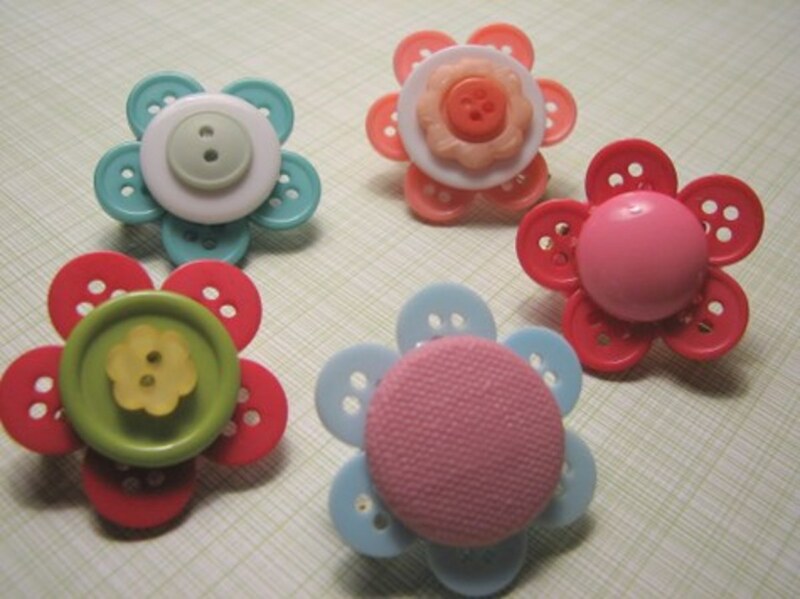 It could be given in a small box or organza bag along with a piece of chalk or a chalk pen/marker. 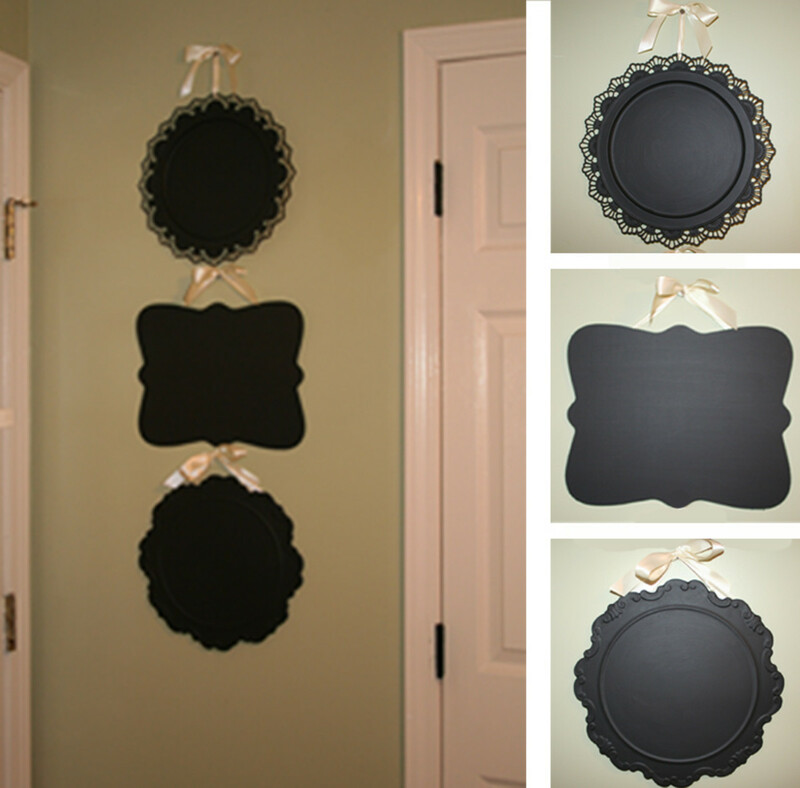 Sweet Mint Studios shares how she made these three chalkboard wall hangings from an old plate charger, old tin sign and a décor piece from a garage sale... I love how they are arranged vertically but would also look nice horizontal or grouped in other ways. I love how they are hung with the ribbon. paper, plate, and plane shares a link to the tutorial showing you how to make this cute and clever chalkboard cake toy.. Kids can decorate it all kinds of different ways, over and over. Little girls would go crazy over this I bet.. well, and boys too, I suppose! Does anyone else watch Cake Boss? This is really an a neat idea for a toy.. I might just make myself one. You could get even more artistic with the chalkboard markers. 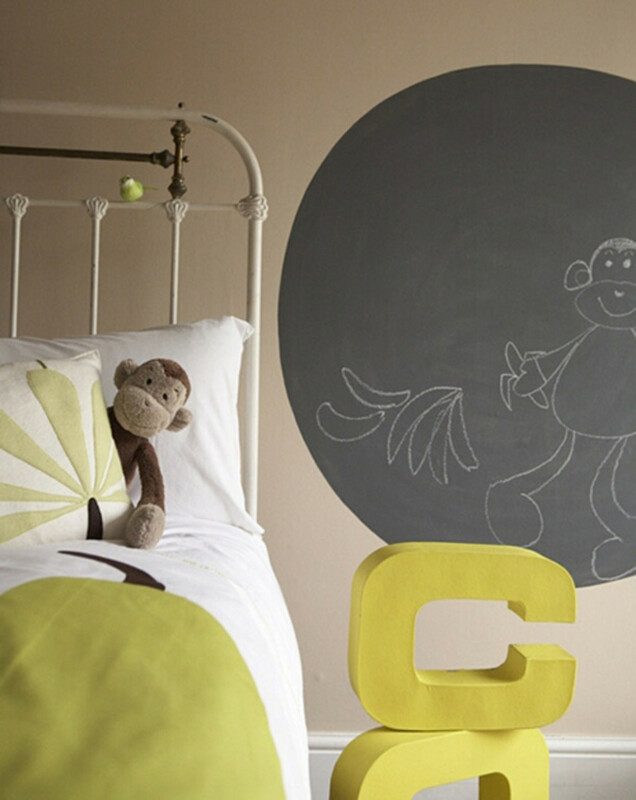 I like this painted chalkboard circle in a childs room I found at Style-Files. You don't even have to mess with a frame.. just paint a circle on the wall. This is fast and easy... and what kid wouldn't love to have a round chalkboard on the wall? Love it! 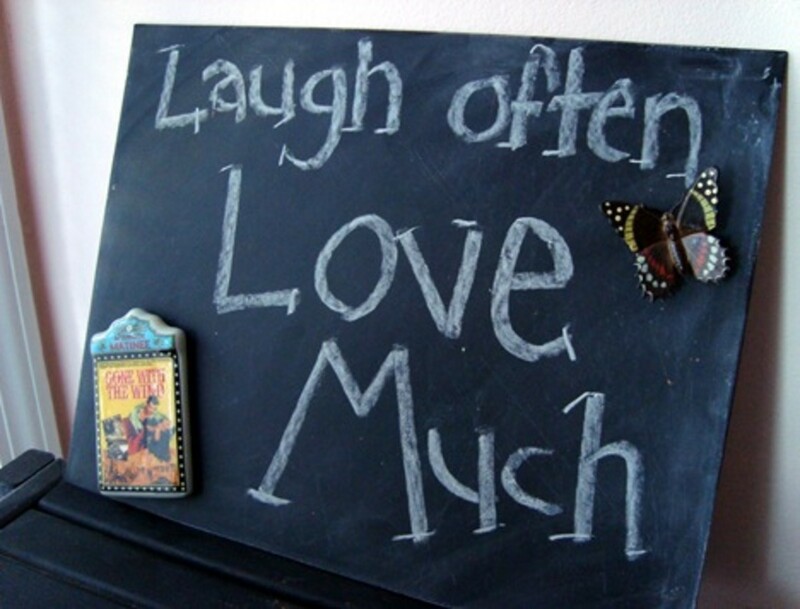 I like this magnetic chalkboard found at southern-belle-simple. It started out as a piece of metal wall art so after being painted with the chalkboard paint, it instantly became a magnetic chalkboard.. pretty nifty, eh? Check out this pretty chalkboard I found at Jubilations. This one and a few others were made for using in weddings as Jubilations is an event planning service and chalkboards have become so popular. 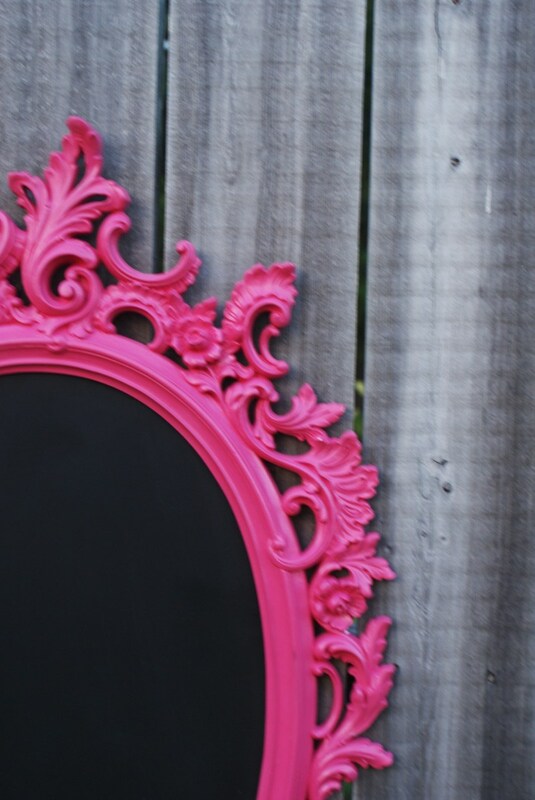 This beautiful framed chalkboard was originally a mirror so you can even use a mirror to make a chalkboard! Visit the link to see exactly how it was made including illustrative photos. 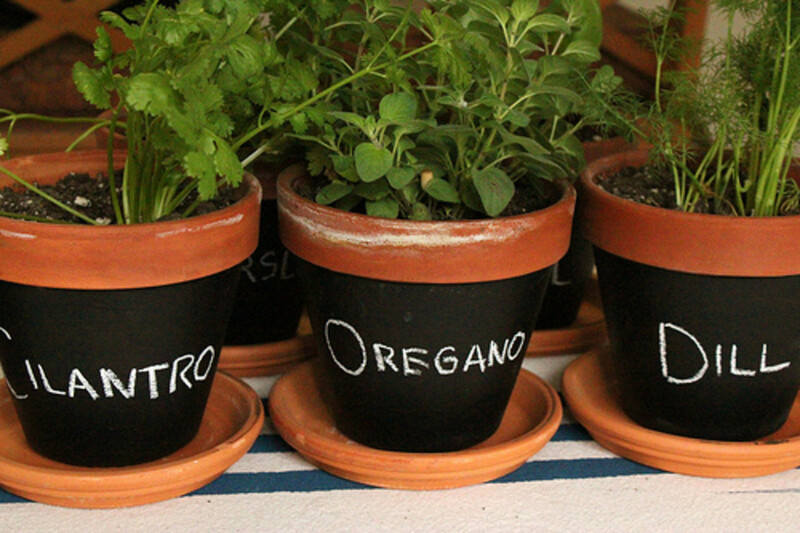 Grow your herbs in cute pots like these with chalkboard labels! I found this one at la chapstick fanatique. You could also plant different flowers from seeds and the labels would be a great way to keep up with different flowers. First off is this one I found at My Lovely Surroundings. These jars were made from saved glass jars from peanut butter, etc. I love how the metal lids are all painted the sage green. 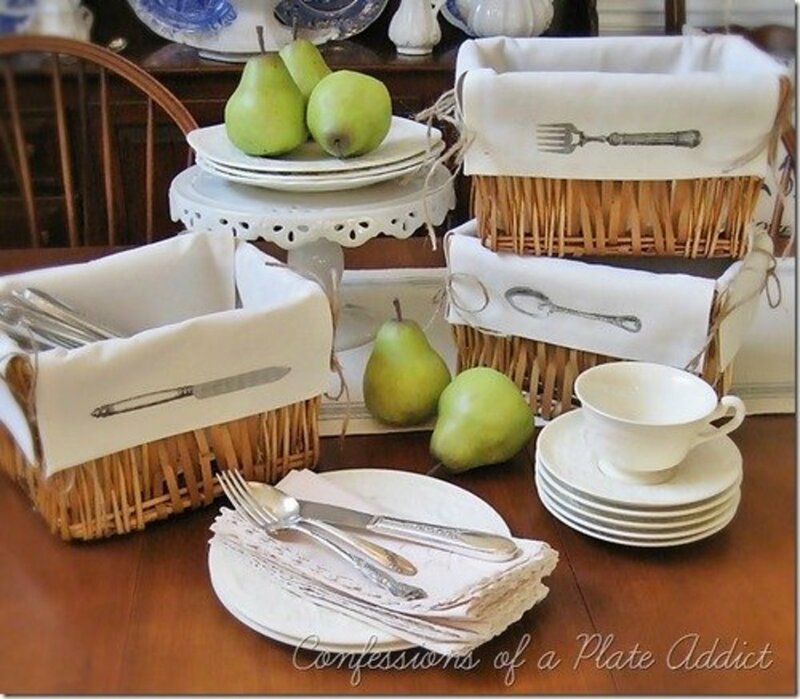 I bet these do really come in handy for storing dried foods. The second one I found at Josh and Rachel-I love these little spice jars with the chalkboard lids... and how she has placed them in a drawer for easy access. 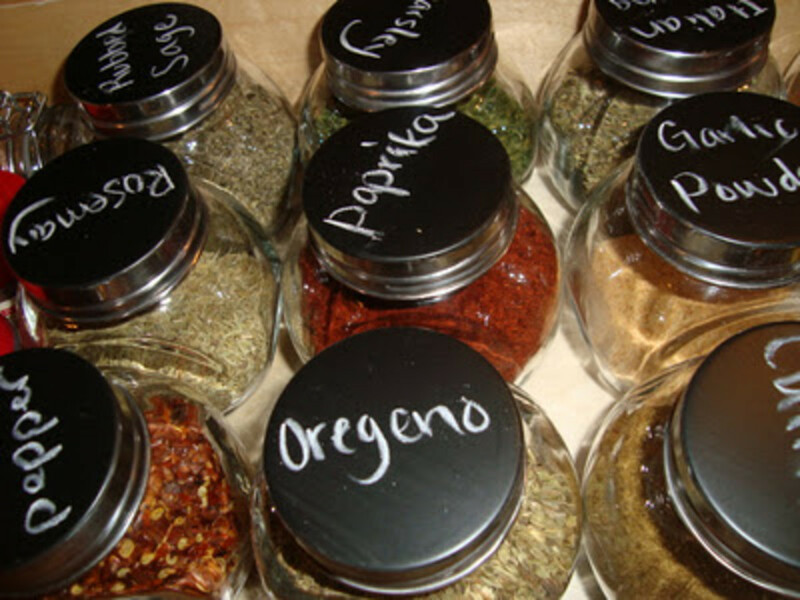 I wish I had more drawers in my kitchen...I think this is a great way to store spices especially for someone who cooks a lot and uses spices frequently. 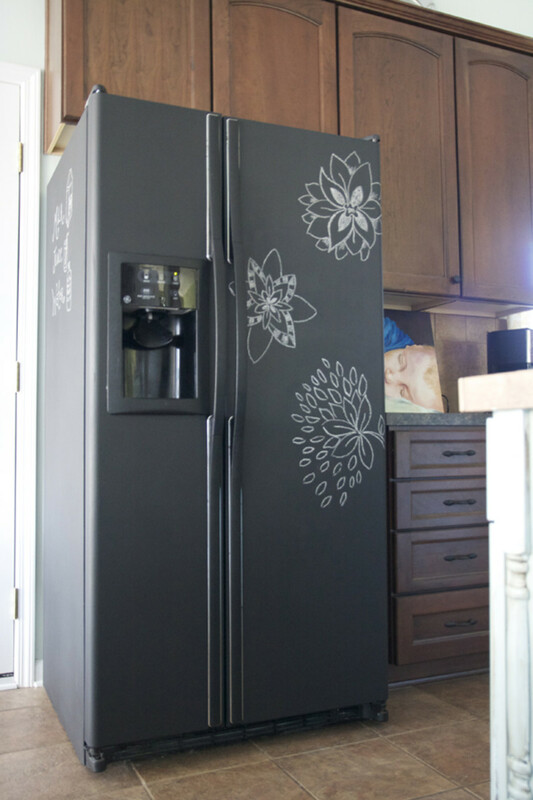 I found this lovely chalkboard painted refrigerator at The Handmade Home. Do you love this idea as much as I do?! You could turn your fridge into an instant memo pad and jot down important dates or leave notes threatening whoever put the empty milk carton back in the fridge! I actually just love the idea of doodling pretty flowers and hearts on it. 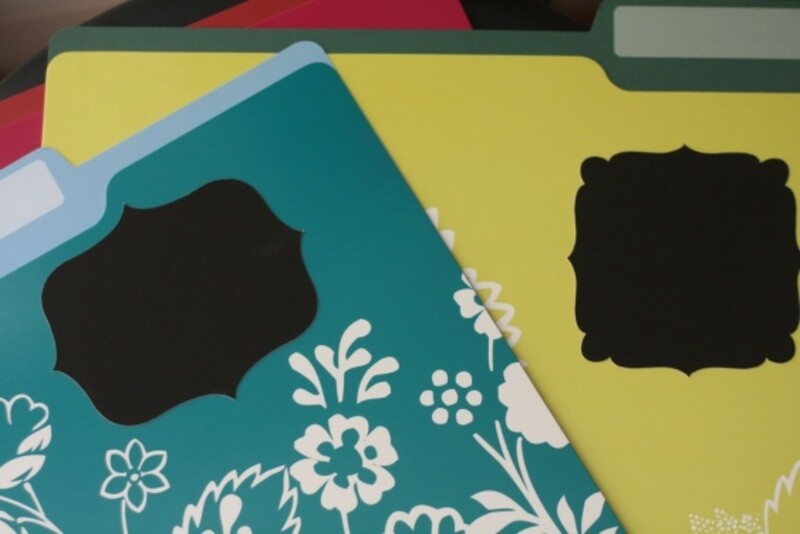 This is a very useful idea for folders that I found at Think Crafts apparently made from chalkboard contact paper. I didn't even know it existed! This is really neat because you will never have to use messy relabeled folders again.. just put a chalkboard label on and you are good for the life of the folder. Visit the link for the tutorial. 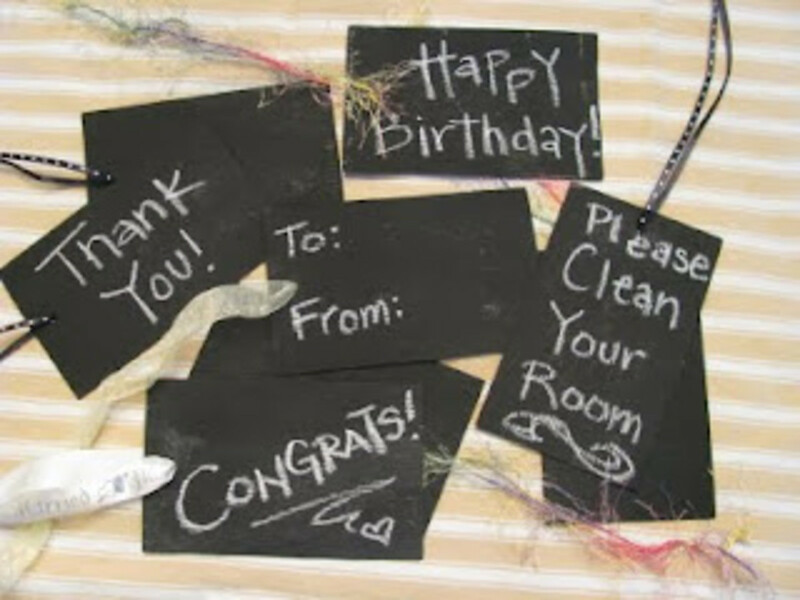 I hope you have enjoyed all of the chalkboard paint ideas, crafts, home projects and tutorials. One last thing.. did you know that there is such a thing as magnetic paint? Many people use it with chalkboard paint to make magnetic chalkboards. I've done some research to see just how good this stuff works and found a great link I'd like to share with you to get the low down on magnetic paint. Visit the Decorologist to learn more. I love the chalkboard wine bottles...great idea. I painted and entire wall in my childrens playroom and they loved it. Great Hub! Claudia Tello- Thank you so much for the votes and for sharing! I agree, all of these projects are amazing! It would be really hard to pick a favorite... Thanks for stopping by! WAW!!! 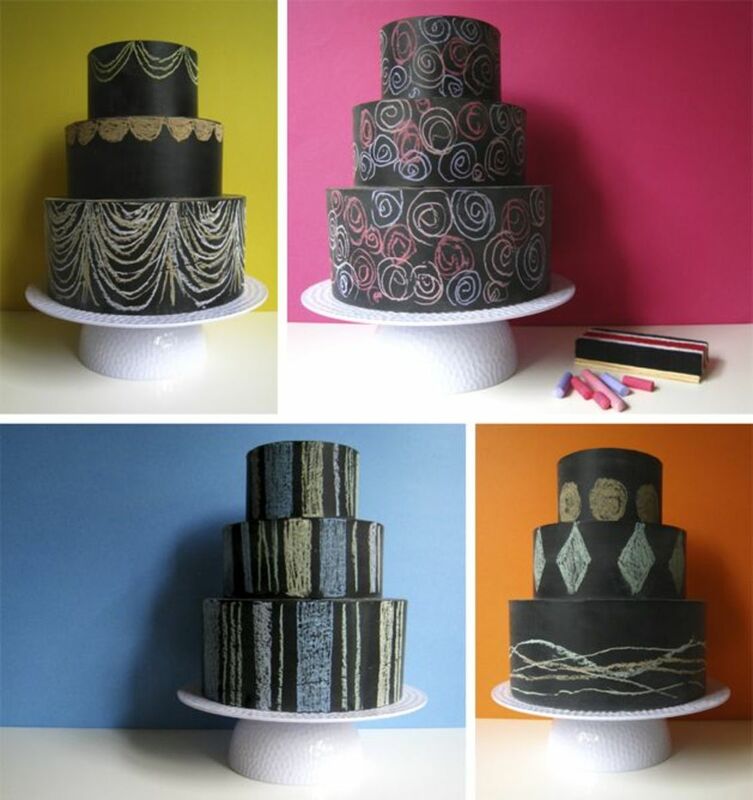 They are all such great ideas for chalkboard applications! I can´t pick out just one of them, they are all fantastic, interactive, and they look very nice and fancy as well! Voted up, useful, beautiful, awesome and shared. Chalkboard Refridgerator is sooo hottie :-) wow! great hub! So my chalkboard paper is working out...I covered an old dry erase board as you know, and it's a smooth surface. However, I can write better with chalk on the small cricut-cut labels I made. Have you tried those chalk markers? How do they compare to standard chalk? RetailRich- Thank you so much for stopping by and for leaving such a nice comment...That was a great idea to use chalkboards in your store. Now-a-days it seems like chalkboards are everywhere. When I make my own chalkboard very soon, I'm looking forward to buying some of the bright chalk markers they have out now. The bright colors really pop up against the black chalkboard. Thank you so much for stopping by! I really liked your article. It shows a lot of imagination and creativity. 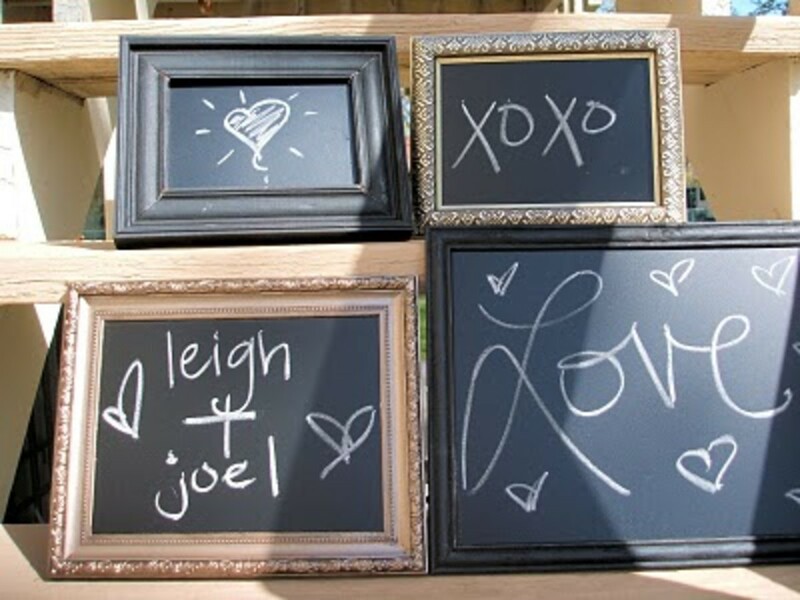 I believe in chalkboard paint as I used it with large frames and made my own signs in my stores. Their flexibility and low cost made them great for use in my stores. I just needed to make sure my lettering was done by someone with some nice printing and cursive skills on the chalkboard. It came across very down to earth and yet professional! You always share great ideas. Thank you very much. Thank you for featuring my tags. There is so much chalkboard inspiration here that I think I need to go buy more chalkboard paint! Yes I do have a pinterest account and I love it! So many awesome ideas. Actually simeyc has just set up a "board" on pinterest for hubbers to post on. The link/info is on a forum thread. And I plan on writing a hub about my project so I'll let you know when it's done, thanks! craftdrawer- Yes, I loved the chalkboard fridge.. and one is definitely in my plans for the future :) Thank you for stopping by! Random, Yeah, it's all about chalkboard paint right now.. but what really blew my mind was hearing about magnetic paint!!!! Thank you for the link! I'll be sure to check it out. I'm always landing on pinterest when researching different projects and the site is awesome. As always, thank you for stopping by! I was just about to paint the side of a file cabinet with chalkboard paint so that I can use it as a giant memo board for my exercise area. Then I saw your HUB so thanks for all the tips. Great hub as always! I voted up, useful and interesting. I like the idea of the chalkboard fridge. My grandson would love this and since they have an older one it would make it look better... great hub!! I hope that you get some great views from Pinterest. I pinned it and got about 25 repins in about 15 minutes! I love these ideas. I'm actually in the process of gathering materials for a chalkboard painting project of my own. (I'm glad to see that it wasn't on here!) 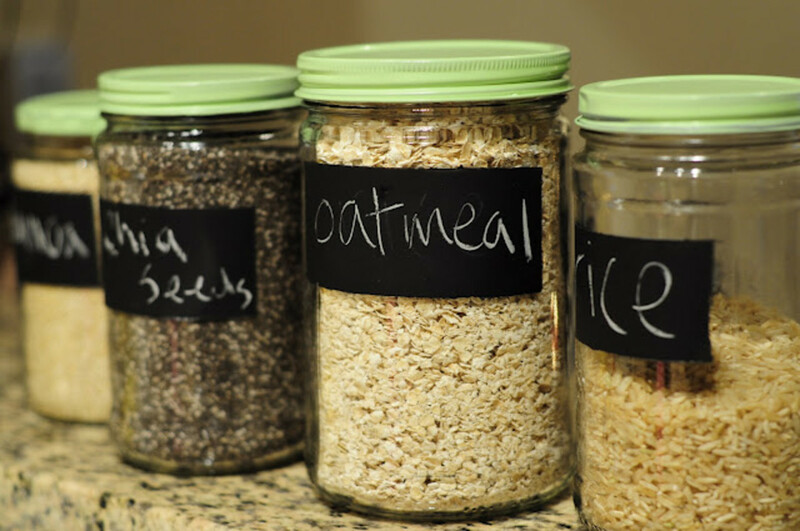 I love the chalkboard lids and jar labels. Thanks for sharing these great ideas! Chalkboard paint is definitely all the rage right now. It seems like every time I'm on Pinterest, I see a new chalkboard paint project. Thanks for this awesome round up! La Chapstick Fanatique- You are welcome! thank you so much for featuring my pots!! Keri Summers- Aww.. thanks! I was amazed by these as well. I just love the idea of using chalkboard paint. Maybe I'll be posting my own tutorial soon. Thank you so much for stopping by! iamaudraleigh- Wow... thank you for sharing this with all of your twitter followers.. I appreciate that :0) Glad these inspired you... I am inspired too.. can't wait to get my hands on some chalkboard paint! Another Hit Hub Jamie! So many great ideas, exploring the possibilities of chalk boarding in such imaginative ways. I love the flowerpots - the magnetic board - the spice jars - I could keep going. Great stuff. Clever!!! I tweeted this! Now, I am inspired! Wendy Finn- Thank you so much! Yes, I love the fridge too. I can't wait to get out of this apartment so I can own my own fridge... It will be painted with chalkboard paint for sure :0) Thank you so much for stopping by! VeronicaFarkas- Wow.. so glad you liked these! Thanks so much for sharing this and for the votes. I really appreciate it :) I love the fridge, too! Yes, chalkboard décor is so hot now. I have chalkboard contact paper! I have yet to use it but when I do, I'll let you know how it goes! 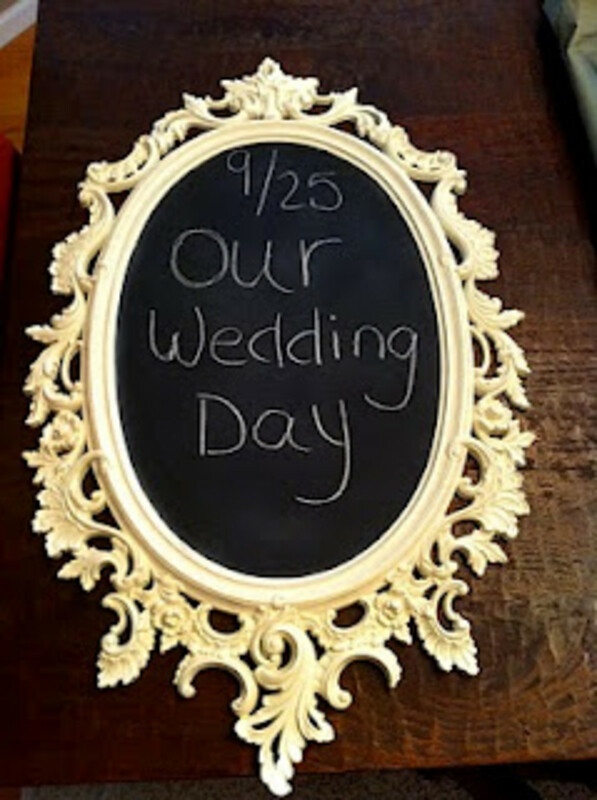 I also had the notion to use chalkboards as signs for guests to pose with at a wedding I'm helping to plan. Hope it works out...Great hub! 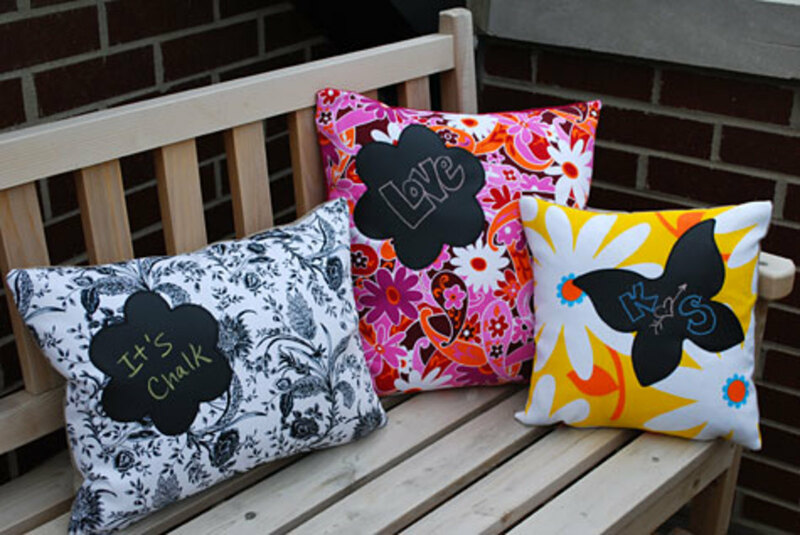 I never would've thought of chalkboard pillows! Up, useful, awesome, & shared!